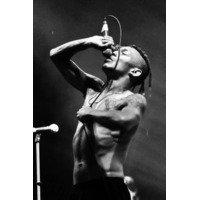 Tricky (born Adrian Nicholas Matthews Thaws, 27 January 1968) is an Englishmusician and actor. As a producer and a musician, he is noted for a dark, rich and layered sound and a whispering sprechgesang lyrical style. Culturally, Tricky encourages an intertwining of societies, particularly in his musical fusion of rock and hip hop, high art and pop culture. His debut album Maxinquaye was nominated for the Mercury Prize and voted Album of the Year by NME Magazine.